The Hope Mouse is a rare breed of mouse usually found exclusively in the Training Grounds, but sometimes is released in multiple locations to increase awareness about disasters around the world. The Developers have confirmed that the Hope Mouse has no specific preference for any kind of cheese. Though the Hope Mouse is an Event mouse, it is available throughout the year in the Training Grounds area. 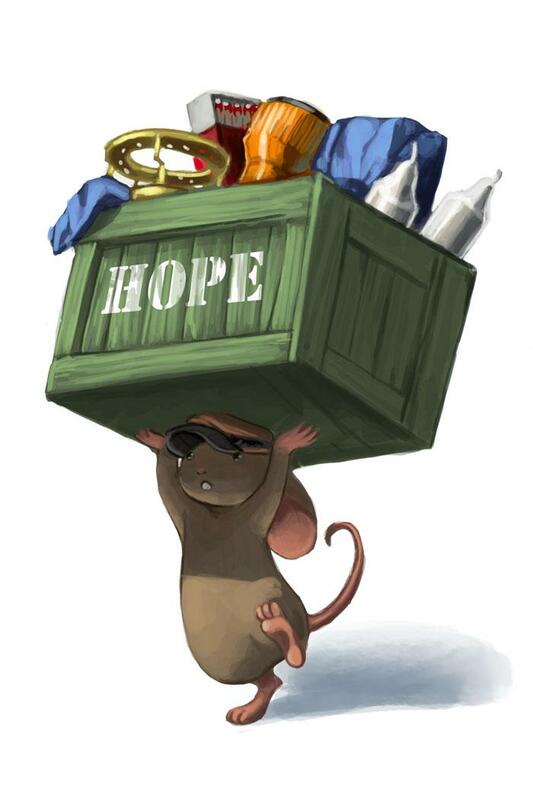 Hope mice were first released on 14 January 2010 as the developers' response to the earthquake in Haiti. Events unfolding in Haiti have sprung this mouse into action. We will be donating five cents to the Mission of Hope in Haiti for the first 200,000 of these mice caught. By sounding your horn you will help us reach our goal of raising $10,000. We greatly encourage all MouseHunters to find a charity they are comfortable with and get involved. When it was released, it could be found in various locations throughout the kingdom (Bazaar, Calm Clearing, Cape Clawed, Dojo, Great Gnarled Tree, Harbour, Laboratory, Meadow, Mountain, S.S. Huntington II, Town of Digby, and Training Grounds), but was later confined to just Training Grounds. Recent events in Pakistan have sprung this mouse into action! Many organizations, such as the Red Cross and World Vision, are currently helping out. Please consider giving them your support. During that time the Hope Mouse could be found in the Bazaar, the Calm Clearing, Cape Clawed, the Dojo, the Great Gnarled Tree, the Laboratory, the Town of Gnawnia, the Training Grounds, and the S.S. Huntington II. Recent flooding in Australia, Brazil, Philippines and Sri Lanka have sprung this mouse into action! Many organizations, such as the Queensland Government, are currently helping out. Please consider giving them your support. Recent natural disasters occurring in Japan and other parts of the world have sprung this mouse into action! During that time the Hope Mouse could be found in a variety of locations including Windmill, Town of Gnawnia, Mountain, Calm Clearing, Training Grounds, Dojo, Town of Digby, S.S. Huntington II and Cape Clawed. Join the discussionto see how you can help out too!"" This page was last edited on 27 June 2014, at 22:27.